Sitting height teller pedestal with two cash drawers and one legal file cabinet is are designed to be both attractive and functional, offering security while complementing your interior design. Constructed from 18 and 20 gauge cold-rolled steel, formed, welded and ground flush to provide a secure and handsome pedestal. All drawers are mounted on full ball-bearing suspensions, which carry a LIFETIME WARRANTY. Dimensions: 27-7/8" H 19" W x 19" D. (Inside drawer dimensions 4-1/4" H x 15-11/16" W x 16-5/8" D.) Wt: 116 lbs. Choose from 16 powder coat finishes. 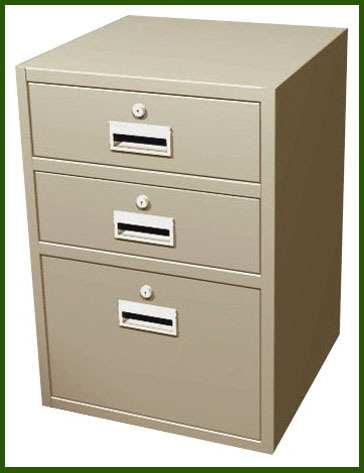 The USBS sitting height teller pedestal has two drawers andone legal file drawer. Dimensions: 27-1/4" H 19" W x 19" D. (Inside drawer dimensions 4-1/4" H x 15-11/16" W x 16-5/8" D.) Wt: 116 lbs., 3" removable base. Choose from 16 powder coat finishes. SELECT A FINISH COLOR:: select one - Champagne Textured Black Fawn Beige Velvet Beige Bankers Gray Desert Sage Arctic Blue Model Gray Stone Gray French Gray MacBICK Beige Rio Blue Putty Cream Walnut Pearl White Navy Blue Federal Blue Burgundy Wedgewood Blue Platinum Charcoal Parchment Tan Glossy Black SELECT A KEYING OPTION:: select one All locks keyed alike Each lock keyed differently Each lock keyed differently but master keyed.